The Bears signed defensive tackle Sedrick Ellis to a one-year contract in June. He didn’t report to training camp Wednesday and has since advised them that he will retire, the team announced.Ellis, a former USC standout, was taken by the Saints with the seventh-overall pick of the 2008 NFL Draft, but never lived up to his lofty first-round status. At 28, he is young by NFL standards, and had no known health issues.Ellis started 70 games over five seasons for the Saints where he had 98 career tackles, 12.5 sacks, and 14 passes defended. Rose says the best NBA Player right now is….himself! While the entire city of Chicago was hanging on every modicum of hope that Derrick Rose would return during the Bulls’ playoff run last season, it was widely reported that it was his confidence, not his physical health, that was impeding his return.Given Rose’s hesitancy to return early from the torn ACL he suffered in the previous playoffs, it has to be reassuring that, evidently, his confidence is back.When asked in a rapid-fire, headline-inducing, 90-second interview with CNN who the best player in the NBA was, Rose didn’t stutter, didn’t hesitate, didn’t even change his tone when he muttered, “Derrick Rose,” in his calm, reassured manner.That didn’t exactly jibe with what CNN’s Pedro Pinto was expecting the former MVP to say, as he questions Rose’s answer and then wondered who the toughest guy to defend was, to which Rose predictably answered, LeBron James.Rose, James and Kobe Bryant are known as the three most competitive players in the NBA, so who could fault Rose for insinuating that he is, in fact, better than James, despite James’ second-consecutive NBA championship this past June? Who cares if it’s a preposterous claim seeing as Rose hasn’t suited up in over a full season? Maybe he knows something we don’t.Let’s not take this interview for gospel, either. After all, Rose, a Chicago native, was asked who his “basketball idol” was, and was then asked how much he watched that certain someone as a kid. So we’ll take this whole charade with a 12-ounce jar of Morton’s salt. Or better yet, we’ll consider it as significant as Rose throwing down a through-the-legs dunk…..on an eight-foot rim.That being said, what to take away from this? If nothing else, Rose’s confidence is back, which is all Bulls fans needed to hear. The Blackhawks announced today that the team will open their 2013-14 training camp in Notre Dame, Ind., at the University of Notre Dame on Thursday, Sept. 12. All Blackhawks practices will be held at Compton Family Ice Arena from Sept. 12 through Sunday, Sept. 15, before returning to the United Center on Monday, Sept. 16, for the team’s annual Training Camp Festival. vs. Detroit Red Wings United Center 7:00 p.m.
vs. Pittsburgh Penguins United Center 7:00 p.m.
at Washington Capitals Verizon Center 6:00 p.m. Sun., Sept. 22 at Detroit Red Wings Joe Louis Arena 4:00 p.m. Mon., Sept. 23 at Pittsburgh Penguins Consol Energy Center 6:00 p.m. Sat., Sept. 28 vs. Washington Capitals United Center 7:00 p.m. Car Bomb headed for La La Land. 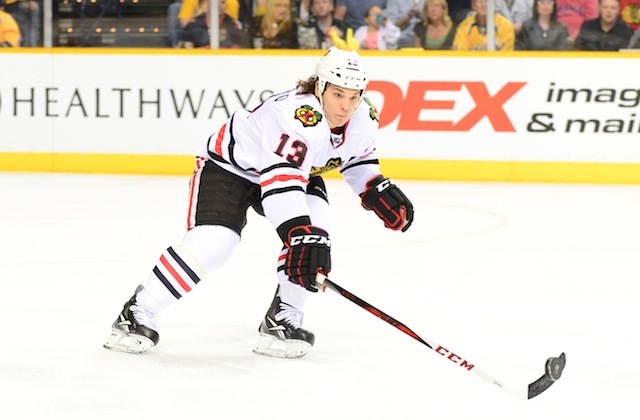 Carcillo dealt to Darryl Sutter’s Kings for a Draft Pick. The Blackhawks have sent forward Dan Carcillo to the Los Angeles Kings for a conditional 2015 draft pick, the team announced on Tuesday evening.Carcillo, known as “Car Bomb”, has one year remaining on his contract and will count $825,000 against the salary cap next season.He appeared in 23 games for the Hawks last season, scoring two goals to go with one assist. He saw action in four playoff games for Stanley Cup Champs.Injuries have really limited him in recent years, and he hasn’t been all that productive. He has been one of the most penalized players in the league since making his debut during the 2006-07 season. Cubs earn second ever season sweep of Sox with 8-2 rout. Matt Garza pitched seven strong innings, Alfonso Soriano homered and scored four runs, and the Cubs pulled away late to beat the White Sox 8-2 on Monday night.Dave Sappelt had a career-high four hits, while Soriano had three. Luis Valbuena drove in three runs, hitting the tiebreaking two-run double and scoring during a five-run eighth.Garza (5-1), meanwhile, came through with another terrific outing. He’s 4-0 in his last five starts after allowing two runs – one earned – and five hits, striking out six without a walk. He’s lowered his ERA from 4.98 to 3.22 during this stretch. Valbuena broke a 2-2 tie with a two-run double off reliever Matt Thornton (0-3) and came around on a single by Sappelt off Nate Jones. Ransom capped the rally with a two-run, bases-loaded single, and the Cubs completed the four-game season sweep against their crosstown rivals and have now beaten the Southsiders in six of the past seven after the Sox had won 18 of 24.White Sox starter Hector Santiago lasted 5 1/3 innings, allowing two runs and five hits.The game, a makeup from May 28, this game was delayed 29 minutes at the start by rain.The Cubs continued to unload players before the game, trading outfielder Scott Hairston to the Washington Nationals for minor league pitcher Ivan Pineyro. In the past week alone, they’ve also dealt pitchers Scott Feldman and Carlos Marmol, along with catcher Steve Clevenger, and Garza could be on his way out, too.General manager Jed Hoyer acknowledged Monday that teams are interested in the right-hander, saying he’s “a guy we’ve gotten a lot of phone calls on” and has “opened a lot of eyes” of late.Garza gave up a solo drive in the third to Josh Phegley, who hit his first career homer against Tampa Bay’s David Price on Sunday. That made him the quickest White Sox rookie to homer in consecutive games since Magglio Ordonez went deep in his second and third games in 1997.Soriano gave the Cubs a 2-1 lead when he knocked a high pitch to the seats in left leading off the sixth, just after lightning flashed and thunder cracked. The home run was his 13th on the season and sixth in 10 games. It was also the 385th of his career, putting him in sole possession of 59th place on baseball’s all-time list ahead of former White Sox All-Star Harold Baines.But the White Sox immediately tied it, thanks to some shaky defense by the Cubs.Second baseman Darwin Barney threw wildly to first on an infield single by Gordon Beckham with one out, allowing the runner to advance to second, and a single by Alex Rios put men on the corners. With two outs, catcher Dioner Navarro bounced a throw to second that Barney could not handle on a double steal, allowing Beckham to score the tying run. It was also the first time a White Sox player swiped home since Juan Pierre did it against Cleveland on Oct. 2, 2010. NOTES—The Cubs completed the four-game season sweep against their crosstown rivals and have now beaten the Southsiders in six of the past seven after the Sox had won 18 of 24. The only previous Season sweep was in 1998 when the Cubs won all three meetings from the Sox. The only time anyone has won more than four in the season in the Cross Town series was in 2007 when the Cubs took five of six….. The Sox have won four of six many times, but never more than four in a single season….Neither team had swept the season series with its crosstown rival since they moved to a home-and-home format in 1999. … The White Sox open a three-game series at Detroit on Tuesday, with LHP Jose Quintana (3-2, 3.69 ERA) starting against RHP Justin Verlander (9-5, 3.54). … All Star Travis Wood (5-6, 2.69) starts Tuesday for the Cubs against the Angels, with RHP Joe Blanton (2-10, 5.14) going for the Angels…..The Cubs outscored the Sox 32-8 in the four games this season. Hawks bring Khabibulin back. Emery and Stalberg gone. The Blackhawks announced today that they have agreed to terms with goaltender Nikolai Khabibulin on a one-year contract. Khabibulin previously spent four seasons with the Blackhawks from 2005 to 2009, including a trip to the 2009 Western Conference Final.The Sverdlovsk, Russia, native has earned a 332-334-58-38 record, with 46 shutouts, a 2.72 goals-against average and a .908 save percentage in 795 games over a 17-season NHL career with Winnipeg, Phoenix, Tampa Bay, the Hawks, and Edmonton from 1994 to 2013, and has posted at least 20 wins 10 times during his career. Khabibulin, 40, owns a 39-31 record, with six shutouts, a 2.40 goals-against average and a .917 save percentage in 72 career post-season games, and was a member of the 2004 Stanley Cup Champion Tampa Bay Lightning.Khabibulin posted a 4-6-1 record, with one shutout, a 2.54 goals-against average and a .908 save percentage in 12 appearances with the Edmonton Oilers during the 2013 NHL campaign. At the same time, Ray Emery and Viktor Stalberg signed elswshere. Emery came to terms with the Philadelphia Flyers, and Stalberg signed with the Nashville Predators, a Division Opponent of the Hawks. Rose talked about the strong bond with his teammates and how he felt they were almost “playing for him” in the playoffs when they upset the Nets and gave the Heat a decent fight in a five-game series.Now it’s Rose’s turn to play for them. It’s going to take a little longer to see Rose on the court, but he’s doing interviews now. He’s working out harder than ever. And the world is still waiting. DEERFIELD—Over the weekend, Bulls general manager Gar Forman decided not to renew the contract of Ron Adams, the top assistant on head coach Tom Thibodeau’s staff.Tuesday at the Berto Center, Forman discussed the decision that could create animosity between he and Thibodeau. “Ron is a great friend, an outstanding coach and I will miss him,” Thibodeau said. Forman, however, was confident there would be no lasting negativity between he and his head coach, who signed a four-year extension with the Bulls that kicks in next season. Hawks re-sign Bickell, trade Bolland and Frolik for Draft picks. NEWARK—Six days after combining on the Stanley Cup-clinching goal, the Blackhawks traded away Dave Bolland and Michael Frolik in order to free up enough space under the NHL salary cap to re-sign Bryan Bickell to a four-year contract.It all happened early in the 2013 NHL Draft at Prudential Center on Sunday. Bickell, who could have become an unrestricted free agent July 5, said he understands that with the big contract comes more pressure to produce like he did in the 2013 Stanley Cup Playoffs, when he had nine goals and 17 points in 23 games and developed instant chemistry playing left wing on a line with center Jonathan Toews and right wing Patrick Kane.Toews, Kane and Bickell combined for 13 points after being reunited starting with Game 4 of the Stanley Cup Final. Bickell scored the game-tying goal with 76 seconds left in Game 6 of the Final off a feed from Toews. Ironically, for Bickell to stay it took trading away one of his longtime teammates, Bolland, who also was part of Chicago’s 2004 draft class.Bolland grew up just outside of Toronto in Mimico, Ontario, and played minor hockey with Bickell for the Toronto Red Wings before joining the London Knights of the Ontario Hockey League. The Blackhawks have acquired the 51st and 117th overall selections in the 2013 National Hockey League Entry Draft and a fourth-round selection in the 2014 National Hockey League Entry Draft from the Toronto Maple Leafs in exchange for forward Dave Bolland. The Hawks also have acquired the 74th and 134th overall selections in the 2013 National Hockey League Entry Draft from the Winnipeg Jets in exchange for forward Michael Frolik. The Czech Republic native has tallied 151 points (61G, 90A) in 349 career NHL games with the Blackhawks and Florida Panthers.